What is an ABA routing number? Each federal or state chartered financial institution in the United States eligible to maintain an account at a Federal Reserve Bank is identified by an ABA Routing Number. These numbers are also referred to as RTNs or Routing Transit Numbers. 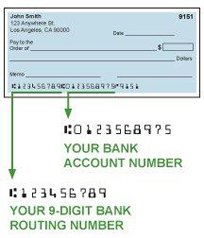 In general, the nine-digit ABA routing number is printed on the bottom left-hand corner of paper checks, although there are certain financial institutions that use different routing information for ACH (electronic check) transactions. Over a century old, the Routing Number system has evolved over time. Originally, the first four digits identified in which of the twelve Federal Reserve districts a check was printed (and a city within that district). Today that relationship is no longer certain as many financial institutions have inherited numbers through acquisition or merger. The next four digits are an ABA institution identifier which designates the bank on which the check is drawn, and the last number is a check digit. ABA Routing Numbers are also used to designate participants in automated clearinghouses, electronic funds transfer, and online banking. Lyons Commercial Data offers two excellent options for payment processors to achieve NACHA compliance and perform ABA Number Verification at a reasonable cost. The iBankRegistry Routing number database is available by subscription as an FTP download or via an XML Web Service. As an added bonus, subscribers can access iBankRegistry data online when performing research on failed payments. Lyons iBankRegistry Online database access provides flexible search capabilities, yielding accurate results even if only limited information is typed in such as partial bank routing numbers or previously used routing numbers. Registered users receive instant access to detailed bank information including phone numbers, fax numbers, and email addresses.